A folding bed is a great solution for someone who is limited on space but still needs to host a couple of people once in a while. Folding beds are also popular in hostels where they are used in guest rooms. 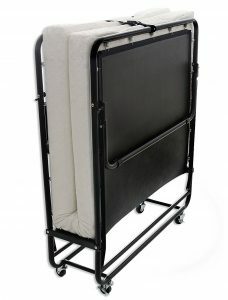 The best portable folding beds should be durable, comfortable and occupy the least space. They should also be easy to use. There are numerous options you can choose from, different colors designs and sizes depending on different needs. This is the most luxurious folding guest bed from Zinus and our top pick on our buyer’s guide. The bed provides comfort than you would ever get from any other bed in the market. 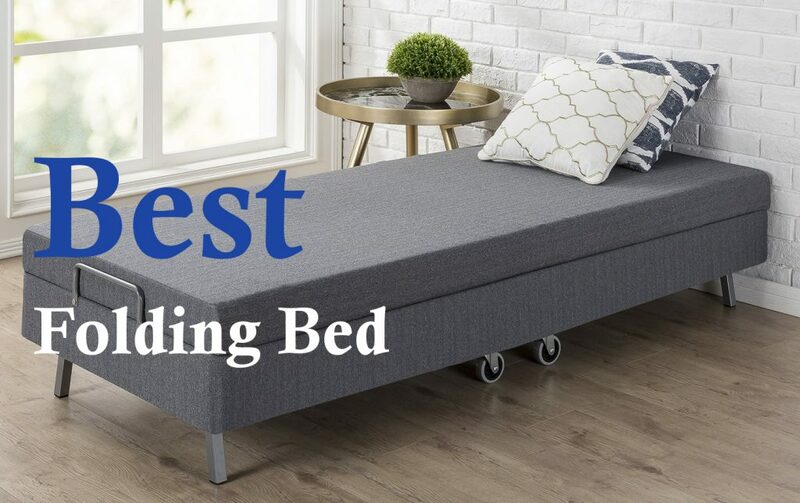 During those moments when you need to accommodate a guest, but you feel like you don’t have enough space to entertain them, this is the folding bed you should consider investing in. 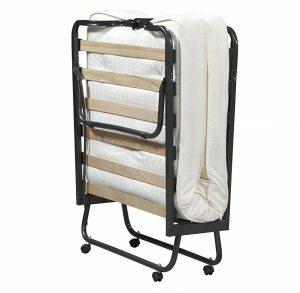 This guest folding bed folds fast, and it has folding wheels that makes setup easy, convenient and fast even when you are extremely tired. With this bed in your home, you still have the chance to serve an emergency guest with the best hospitality that defines your character. The best thing about this folding bed is that it comes with a mattress that has different layers to serve different purposes as far as your comfort is concerned. It has 4 inches of high-density base form and 1-inch memory foam. This combination ensures that your guests are comfortable and enjoy their night away. The foam that is used in making this mattress is the best. It has the best combination that ensures your folding bed is protected from all unwanted odor. Additionally, this foam is not like the traditional foam that is full of petroleum but rather its meant of natural plant oil, which makes it exciting to sleep on. Guests visit occasionally, therefore you are sure that this Folding bed will last long enough to keep your guests happy every time they come to your place. This Folding bed is designed to ensure you save cash that would have been used to pay for a guest house or something. Additionally, this bed comes with a one-year limited warranty, which gives you a guarantee that the bed will last long. When your guest rests on this bed, they will not even remember that it was a folding bed thanks to its 4-inch mattress. This size of mattress ensures that your guest receives the appropriate rest and wakes up refreshed and energized to face another day. Need I to say about the foam memory, this just works magic. Additionally, it has a rayon cover from bamboo, which regulates the sleeping temperature and is ideal for sensitive skin. The folding bed is easy to set up for a night sleep. It has wheels that roll evenly and fast to ensure it takes you fewer minutes to get it ready for your guest. Additionally, the wheels can lock once the bed is set for safety. When you want to transport it, it folds fast, and you can use the wheels to roll it to your respective destination. It’s also designed in a way that even with frequent movements, it will still retain its looks, therefore, making it durable. Nothing fits as this folding guest bed. It’s designed with a lightweight powder coated steel frames, that make transportation easy and convenient. The design is engineered for strength and longevity. Milliard as a company has ensured that no initial problems that come with folding beds are this premium folding bed. They have worked with a lot of expertise to ensure that the final product of this bed is something you will be proud to use. The folding bed comes ready to use with almost everything assembled, therefore it will not take you a lot of time to get it set. Assembling it is as easy as 123. The needs of the bed are to ensure you rest perfectly and wake up refreshed and energetic to face another day that is what you get with this easy to use a folding guest bed. You can set it any space, and you are sure it will derive the point of comfort that you want for. It comes with basic assembling steps that are easy to follow as 123. It has easily foldable legs that make it easy for you to roll it away when you want the space for other purposes or when the guest is gone. Additionally, the bed comes almost ready for use; therefore, it will save most of your precious time for other use rather than assembling the bed. This premium folding bed will not take you more than 10 minutes to get it ready even if you include unboxing all through to a comfortable nap. If you are the type of person who entertains guests more often, this is the bed for you. iBED hideaway folding guest bed guarantees you comfort since it’s built with sturdy steel frames and a mess under the 2” foam, mattress unlike other beds with rail bars. Additionally, this folding bed comes ready to use since it does not require any assembly. 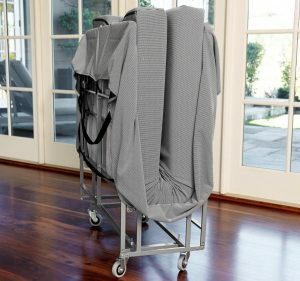 It works best for both adult and kid guests thanks to its 275lbs capacity size. 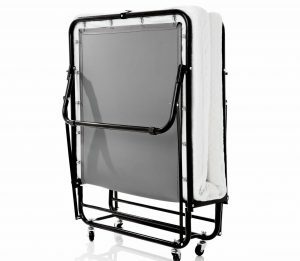 This iBED hideaway folding bed is designed with lightweight steel frames that make it easy for you to travel with. It also comes with a bag for easy storage, which makes carrying it easy, flexible and friendly. It folds easily and fast. Therefore, you will not have to use so much effort while planning to travel with the bed. The fact that it does not require any assembly is enough to tell you that it’s easy to use this iBED. It unfolds faster. Therefore, it will not take long before you can enjoy resting on it. Unlike other guest beds, this one comes with a storage bag. Therefore, when it’s not in use, you can store it safely. This in return guarantees you years of service since the bed does not accumulate unwanted foams that make it difficult to use. Additionally, when you store it in the bag, it maintains its original look for long. It’s also designed with sturdy, lightweight steel material that makes it extra durable. If you want to entertain your guests in a more comfortable style, then all you need is to invest in this ultimate folding bed. It has a thick mattress that every guest who sleeps on it will surely have comfort than ever before. 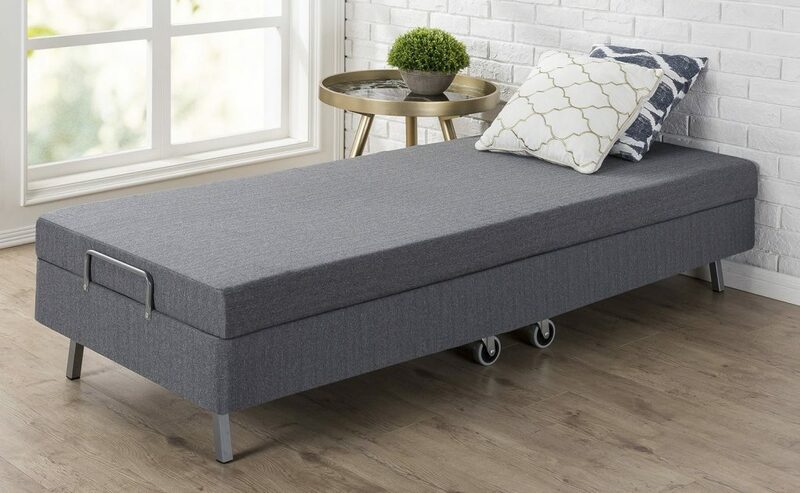 This linon home décor Luxor folding bed is easy to assemble, which guarantees you that you will not waste so much time to get it ready for a night sleep. Its also designed with sturdy material for longevity. It only takes few seconds to get the folding bed ready. It comes with easy steps guide to ensure you get it right and it provides the comfort you wish. This easy folding bed does not require a lot of storage space when not in use, therefore, making it convenient for occasional guest. Knowing that you will not be pushed to get back to the shops to buy another set of guest bed within a short while is the joy you get by buying this set, It provides you with years of service, which is a good thing for your money. This bed is designed with quality material to ensure it goes beyond the usual household wear and tear. 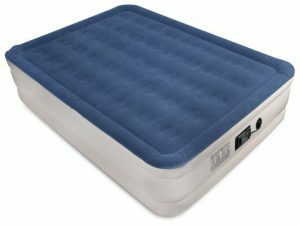 Soundasleep dream series air mattress is one of the best airbeds on the market. It’s designed with so much technology to ensure it gives you comfort overnight. This dream series comes with an inbuilt pump to provide effortless inflation. Within only 4 minutes, the folding mattress bed is fully inflated and ready to give you comfort throughout the night. The pump also eliminates loss or air or sagging, therefore; you will sleep evenly and enjoy your rest. Additionally, this airbed is designed with heavy-duty material for longevity. It comes with a bag that makes it highly portable. If you invest in this folding bed, you don’t have to be worried about how to get it ready for a night sleep. It comes with instructions on how to inflate and everything is right at your disposal. Therefore, you don’t require any special skills to inflate the mattress. Additionally, it will only take you four effortless minutes, and the entire bed is ready for use. It also comes with an in-built pillow to ensure you don’t struggle to look for a pillow that will be compatible with the mattress. This air mattress is designed with multiple layers of material to provide its puncture resistant. This automatically guarantees you longevity. Additionally, the material is waterproof and tear resistant, which ensures that it will give you years of services without fail. It also comes with a case bag for easy storage, thus keeping it clean and safe as new all the time. During those moments when you receive unexpected guests, all you need is to equip yourself with this folding airbed. It only takes you few seconds to get the bed ready for a night rest. It comes with an inbuilt pump that makes inflation easy and convenient. When not in use, it folds down within seconds for easy storage. This an ideal bed for camping and other outdoor activities. It comes with an electric remote control to ensure you are comfortable while sleeping on it. You can use the folding airbed anywhere you are. You can take it with you for camping while going for a vacation or simply keep it in your house as an additional guest bed. It does not require particular skills to assemble the bed. Therefore, you are sure even when you are tired; you can still get it ready for a night rest. 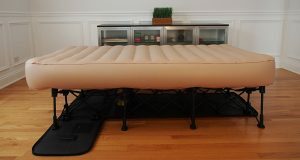 This airbed is designed with a lightweight material for easy portability. Inflating and deflating is faster, therefore, assuring you that you will not waste time trying to get it done. Also, it comes with a carrying bag to ensure its safe as you transport it from one place to the other. It folds down to a compact and small size that enables it to fit in almost every closet, therefore, making it easy to store. Rental homes bring limitations in the type of furniture you buy to furnish your house. This is due to the limited space. There are spaces where you cannot even afford to buy a folding guest bed since you will not get the space to set it up. If that is your challenge, then you can now relax. The market is ready now for something that will be worth your investment. The Intex pull out sofa is convenient for any space size. Use it in your living room as you enjoy watching your favorite TV show or while catching up with a guest, then when it’s time to sleep, just pull out the cushion and start dreaming within seconds. It inflates well to meet the size of a 4-5 inch mattress foam. 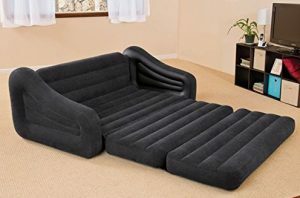 This pull out sofa has two valves that help in inflating and deflating, therefore it will only take you few seconds to get it ready even for unexpected guest. The sofa converts easily from a normal sofa into a bed, and it can hold even two people, therefore, if you receive more than one guest, you will still be ready to serve them with the best hospitality and comfort. This simplysleeper hideaway guest bed is full of style and technology. It gives you pride for your money. The bed comes ready to use therefore it will not take much of your time trying to figure out how it’s supposed to be, thanks to its touch-free inflation system. It’s made of a steel frame that is powder coated. The systems extend automatically, therefore, forming a more comfortable bed for a night rest. The material used in making this folding bed is of the best quality on the market. Therefore you are sure that it will serve you for a long duration without experiencing tear and wear. Additionally, it can hold up to a maximum of 300lbs, which guarantees you that it’s strong enough for your one time guest. The steel frames are sturdy and reliable. The design is crafted with a lot of technical expertise to ensure you feel the worth of investing in it. This bed comes with simple setup steps to ensure your precious time is treasured for other personal use. The built-in pump will only take you less than 5 minutes to get the bed fully inflated. It comes with a travel roller case for easy portability and storage. It also folds up fast. There are several things you need to consider when choosing the right folding bed for your home. These factors make a difference between a great choice and a terrible one. A great guest folding bed should be durable, sturdy comfortable and portable. The first thing you need to think about is the size of the bed you are looking for. Folding beds come in various sizes and designs. There are twin and queen size beds that are available. If you are hosting guests on a regular basis, ensure that you have the right size and weight that will comfortably carry the weight of your guests and still have them sleep comfortably all night. You have to consider the brand and the material makes the folding bed you buy to guarantee durability. Read reviews from the manufacturer and ensure that their products are made with high-quality material and that last longer. A great way to know the durability of a folding bed is to check its material make. In most cases, bed made of steel last longer than those made of aluminum. This combined with a great mattress, your guests will have a great night sleep. There are several types of folding beds. You need to ensure that you will not have a tough time to fold and unfold the bed. The wheel configuration is something you should also look at. Ensure the wheels allow the bed to be moved to other areas of the home. Ensure that the wheels are made of high-quality materials. You also need to measure the dimensions of the area you will be placing the bed to ensure that it will fit.